Mr. Blue Meets A Super Swimmer Book and DVD. They also provided several Sammy the Salmon Swim Scholarships to children with autism who did not know how to swim. Since 1988, The Majic Children’s Fund has helped South Florida children in need, as well as their their families, get through difficult situations. Local radio legend Rick Shaw, the President of the Majic Children’s Fund, has been a tireless supporter and his leadership has made a real difference in its success. Swim With Mr. Blue is a unique swim program created by Julie Gross that was originally designed in the form of a children’s book, DVD and colorful puppet show. 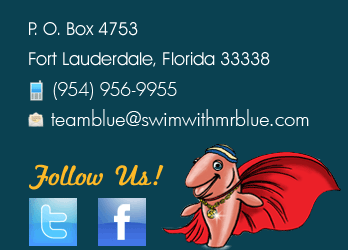 Mr. Blue and his crew help teach children to swim both safely and successfully in the water. For more information about swimming lessons, puppet shows, CPR/First Aid Classes, Mr. Blue Swim Training, book signings and speaking engagements visit their website! Chariots 4 Charity helps non-profit organization raise funds through vehicle donations. A membership with Charities 4 Charity is free and provides your charity with numerous benefits. They will provide you with your own customized vehicle donation page that supporters can use to donate through. They will also provide you with easy instructions to place a vehicle donation link on your website so that supporters can easily donate. Membership also gives you access to our various marketing materials for your organization's specific branding and message. ASD Centers, LLC is a multi-specialty physician healthcare provider with offices nationwide. We specialize in providing medical evaluations and individualized treatment options as in-network providers with most major health insurance plans for patients diagnosed with Asperger’s Disorder, PDD-NOS, autism, autism spectrum disorder, ADD, ADHD, and other neurodevelopmental disorders. Our team of highly trained medical staff can provide assistance for patients in the areas of genetics, endocrinology, neurology, psychiatry, nuclear medicine, radiology, psychology, and reproductive medicine, and helps provide patients with evaluation and treatment in the areas of genetic syndromes/markers, mitochondrial dysfunction, hormonal imbalances, oxidative stress/inflammation, detoxification pathways, immune system function, heavy metal exposure, neurological dysfunction, and general health status. Autopilot (Pool Pilot Salt Generator )Autopilot (Pool Pilot Salt Generator ) makes sanitizing your pool so much easier. The AutoPilot® system generates chlorine right in your pool’s plumbing system, preventing you from ever having to buy chlorine again. Prevents red eyes, green hair, itchy skin and faded swim wear, and leaves the water feeling soft and silky. Relax and enjoy… when you put on AutoPilot®. Language Link Therapy is a privately owned, family-run therapy clinic that provides speech, language, occupational and feeding therapy to children and young adults of all ages. Our team provides therapy utilizing a “whole family” approach that involves both the child and his/her entire family. We provide a customized plan for your child, sibling education and involvement, family education and a home program. A “whole family” approach can enhance a child’s progress and the family can see a substantial improvement. Project Lifesaver International is a nonprofit 501c3 organization which provides in depth training for law enforcement and other public safety agencies on the use of specialized electronic search and rescue equipment, technology and procedures, as well as teaching rescuers how to interact and communicate with people afflicted with cognitive conditions, all of which are essential to the successful rescue of missing persons who wander or otherwise become lost. They certify search and rescue personnel and provide ongoing consultation and assistance to member agencies. Here we provide more than just the luxury of spa treatments. At Marie-Josée Therapeutic Massage, we provide therapy. While we do intend that upon leaving our Clinic you feel relaxed and rejuvenated, our main concern is your wellness and well being. Our services help all ages, from new born infants to retiring seniors, offering you a wide array of therapeutic massage procedures that can help you both feel and be better. In an attempt to accomplish this well being, we often combine our massage procedures to provide the best health care we possibly can. From conventional to atypical, we have all the tools you need to feel and be healthy.